Functions, threads and userdata also have environments. An environment is a containing scope. Environments are tables. You can change or replace a function's environment. change without replacement affects others You can turn a function into a closure after the fact You can mess with your coroutines. http://luarocks.org/repositories/rocks/ ~ a few hundred packages LPeg, Fancy Parsing Expression Grammers parsing, like perl6 grammars Coat, OO model based indirectly on Moose wrappers around popular C libraries. a web stack (from tcp up) that nobody much uses. From http://shootout.alioth.debian.org/: Perl wins with tr///. 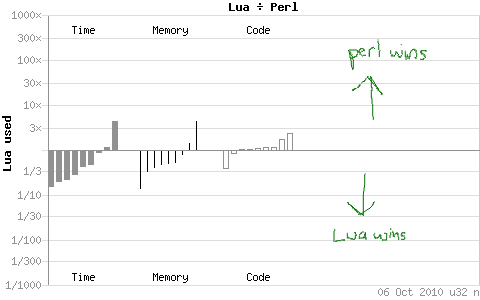 Lua wins with arithmetic. tr/// still wins. 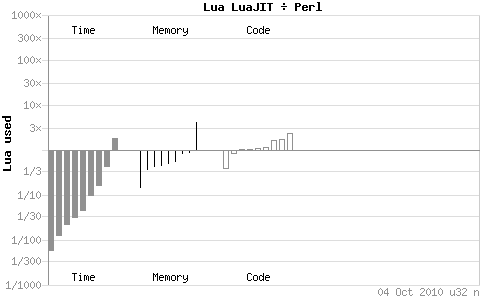 Even with JIT, Lua generally uses less memory in artificial benchmarks. 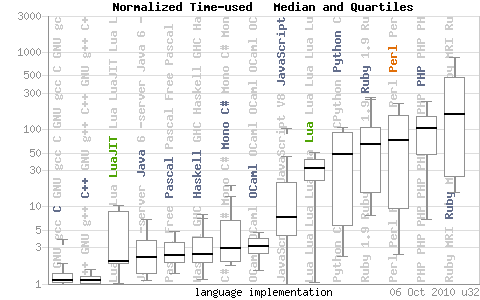 LuaJIT is as fast as Java.